Owen-Murakami and VanAmeyden will speak about their work beginning at 6:15 p.m. just outside of the Art League Gallery followed by an opportunity for questions and answers with visitors. Immediately following, Mark Pohlad, Associate Professor of the History of Art and Architecture at DePaul University, will speak about the exhibition in the adjoining Warner Gallery, Through the Looking Glass, and the history of the daguerreotype. Heritage Habitats is a series of physical spaces for contemplation and invocation of ancestry. Framed around nostalgia and memory Heartwood, Grove and Roots are large-scale, sculptural and experiential installations that engage in viewers’ unique memories and experiences. In essence, the work emphasizes commonalities that bind people and cultures and serve as an expression of humanism. The installations explore collective memories through vernacular photography and the act of pursuing one’s history as a universal human experience. They are concerned with imaging oneself in a genealogical lineage while contemplating basic life stages. Ginger Owen-Murakami (b. 1971, Lake Wales, FL) is Associate Professor of Photography and Intermedia at the Gwen Frostic School of Art, Western Michigan University in Kalamazoo, MI. She holds an M.F.A. in Photography from Louisiana State University and a B.F.A. in Photography from The University of Central Florida. Owen-Murakami’s artwork derives imagery from narratives and themes of family history, race, gender and culture. Her interdisciplinary practices include installation, sculpture, digital, traditional and non-silver photographic processes. Vicki VanAmeyden (b. 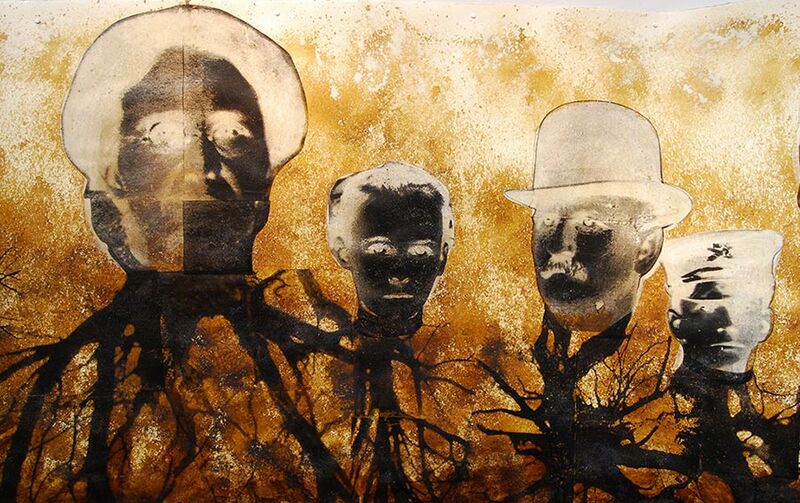 1962, Battle Creek, MI) is an artist/printmaker whose interdisciplinary approach expresses the human condition with metaphor and non-traditional materials. She received her M.F.A. from Western Michigan University and is currently Head of Printmaking at the Kalamazoo Institute of Arts.